With the season of fear and horror upon us (or at least ready for exploitation), I have a little contest. 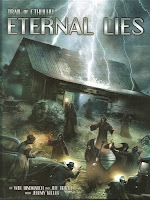 I've mentioned before Eternal Lies, the massive Trail of Cthulhu campaign just released. Pelgrane crafts smart larger supplements for this game from the improv campaign of The Armitage Files, to the brilliant framework of Bookhounds of London, to the genre emulation of Shadows Over Filmland, and beyond. Great games often come to be defined by great campaigns and modules. CoC brought us Masks of Nylarlethotep and Walker in the Wastes for example. I think Eternal Lies will stand with those. And I'm giving away another copy of it. Pelgrane Press has once again generously gifted this 400-page hardcover tome as a prize. 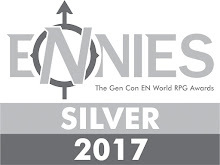 They remain an awesome company, and not just because of this. 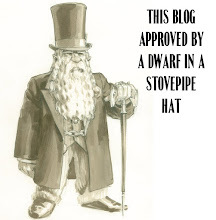 Accordingly I've come up with another little contest. I love setting and place details in horror games, and Eternal Lies uses them to effect. From the presence of feral beasts to grue coatings to the jungle stones So for this contest all you have to do is leave a comment on this thread, along with horrific or unsettling detail about a place. You can also enter by posting in a similar thread you’ll find in the Pelgrane Press G+ Community. 2. You may enter up to twice: once here and once in the Pelgrane G+ Community thread. 3. You should leave an interesting and evocative place detail. 4. The winner will be chosen at (or a little after) noon EST on Wednesday October 30th. I will make consolidated a list of the entries on both threads and then use an online random number generator to pick a winner. 5. Winners will be contacted via email or the like. If I don’t hear back from the winner within 48 hours, I’ll pick another winner. 6. The winner receives a hardcover of Eternal Lies mailed to them. A comment. "... this glistening floor eerily felt like it was slightly twisted from its normal orientation. The mere act of keeping composure, let alone trying to take a few steps, required almost more effort than available. Then, behind me, I felt..."
You're begining to realize that space is not isometric here. Distance is not equal, regardless of the direction to travel. It seems that certain directions are... favored... by whoever built this place. Travel back towards the door and the journey seems to take much longer than it has any right too. Travel forward and you get there much faster than you are prepared to deal with. The deep freeze in the morgue was suddenly incongruous with its very nature, pockets of warm and stagnant air dotted the space around each door. Lichen and fresh shoots emerge from inside, hinting at a primordial realm secreted within. You realize that the stones above the fireplace opening don't look quite 'right.' As you look at them more closely, you would swear that you see the surface of the stone move and form the shape of questing fingers. A foul odor wafted on a cold draft travels up from the fireplace. The door was formidable, non-negotiable, set into the end of the corridor with the grim finality of the gunshot at the end of a scream. The fire ax did nothing, clanging off the steel core, handle splintering against the stolid handle. Sparks from the useless blows contributed to the scant light leaking through the keyhole, it's tiny ray threatening to illuminate whatever thing crawled behind him, claws tinkling as it dragged itself closer, flesh rasping against the concrete like a struck armadillo skidding to a stop on the highway. Impossible to see how close in this inky darkness. Impossible not to imagine it's hot breath washing over his neck the very next second. Or the next. Or the next. Bent over, frantic, peering through the keyhole to see if anyone could hear his cries, he gasped at the tiny ray of light, a drowned man desperate for the last bubble of air. In his panic, he forgot that doors with keyholes large enough to let light in hadn't been manufactured in nearly a century. The black leather of the book's cover was worn and soft to the touch, somehow, it never seemed to be cold or chill, it was always warm and welcoming as if it wished to be held, to be read. The lighthouse on the north point is hundreds of years old. It was eventually converted to a store house and finally just boarded up to be forgot. During episodes of thick fog that periodically roll in from the ocean, some say they can see an eerie light shining from the top of the abandoned tower. No one has explored this claim, but the boards covering the back door are oddly loose and seem to welcome anyone interested in exploring the structure's shadows. I entered the room and my anxiety level jumped, causing me to look nervously behind the door and searching behind the draperies, my heart racked with paranoia. Then my ears finally heard the reason for my unease -- a low thrumming sound, almost as if the stones of the walls were moaning. In basement, a steady drip-drip-drip sound can be heard if you listen closely. Walk around and you can pinpoint it to be coming from above, but there is no sink, or toilet, or any pipes or ducts whatever on the floors above. In fact the sound can only be heard from the basement, and listening from the precise point above on the ground floor yields nothing. But back in the basement, the steady, if muffled, dripping goes on and on, it's enough to drive you mad. On this festive Halloween Day, I have randomly rolled a winner: Whit Mattson with his entry- "The deep freeze in the morgue was suddenly incongruous with its very nature, pockets of warm and stagnant air dotted the space around each door. Lichen and fresh shoots emerge from inside, hinting at a primordial realm secreted within." So Whit, send me a mailing address and I will get this four+ pound beast sent out to you. 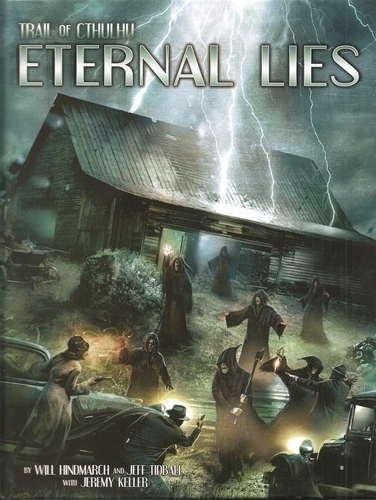 Once again, thanks to Pelgrane Press for donating this copy of Eternal Lies an awesome campaign everyone should buy.